The SOKO G-2 Galeb (English: Seagull) is a two-seat, single engine, jet trainer and ground-attack aircraft developed in Yugoslavia. Yugoslavia's VTI (Aeronautical Technical Institute) began design work on the airplane, named Galeb, in 1957. The Galeb features a straight wing with tip tanks, Folland Type 1-B lightweight ejector seats, sideways hinging canopy transparencies and under-wing hard points for light bombs and rockets. The first flight of the prototype, Galeb 1, was performed by captain Ljubomir Zekavica on 31 July 1961. Galeb 1 had three rubber tanks in the fuselage, while Galeb 2 had two fuselage tanks holding 230 gallons (US) and two wingtip tanks holding 51 gallons (US) each. Soon, after a full-size wooden mock-up, the second prototype Galeb 2 was built - establishing the G-2 type designation. During flight tests, a maximum speed of 812 km/h (440 kt) at 6,200 m (20,100 ft) was achieved in clean configuration, with no paint and a polished airframe. Top diving speed was Mach 0.81, obtained after a prolonged dive. Without a pressurized cabin the practical ceiling is between 7,000 (22,800 ft) and 9,000 m (29,000 ft). A pressurized cabin would have increased costs by up to 15% because all components needed to be imported. The Air Force needed a trainer with secondary combat ability that could operate from unprepared runways. Not familiar with such requirements, the designers provided for landing gear strong enough to make the aircraft suitable for landing on aircraft carriers. The need for a safe training aircraft that is forgiving on landings meant that the wheels retract into the wings instead of the fuselage, making for a heavier, straight wing, which is less likely to stall on landing, but precludes supersonic flight. It was flown primarily by the Air Academy of Yugoslavia. Production ceased in 1985. Production began in 1964, making it the first indigenous jet to enter mass production in Yugoslavia (the first jet-powered plane built by Yugoslavia was the Ikarus 451M in 1952, which did not enter production). After the Soko 522, it was the second aircraft built at SOKO, Mostar, Bosnia-Herzegovina. 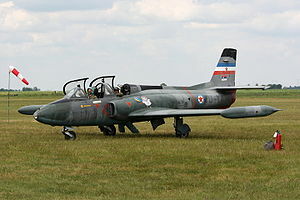 The first production series G-2A was entered in the aircraft register of the Yugoslav Air Force on 30 July 1965, and the last one on 6 January 1981. The G-2A was known in Yugoslav military under the N-60 designation. Production of updated aircraft for export to Libya was extended until mid-1983. Soko produced a total of 248 Galeb aircraft, 132 of which were used by the Yugoslav Air Force. Powered by a license-built Rolls Royce Viper Mk 22-6 turbojet, the G2-A was the standard version for the Yugoslav Air Force. They were used primarily for school-combat training of VVA (Military Air Force Academy) cadets, so that the largest number of these aircraft was located in the VVA units. The aircraft was very easy and forgiving in flight, with easy maintenance, so students and technicians loved it. They regularly achieved 5,000 hours in the air (the G-2 Galeb in the Yugoslav Aeronautical Museum had 6,200 hours in its logbook). A G2-AE export variant became available from late 1974 and was built for Libya and Zambia. The G-2A was used extensively by the 105th Fighter-Bomber Regiment of the Yugoslav Air Force, in combat over Bosnia-Herzegovina. According to some reports, France and Yugoslavia supported Mobutu's government during the First Congo War. Namely, Yugoslavia agreed to deliver three J-21 and one G-2 aircraft, as well as four MiG-21s, while three Mi-24s were purchased from Ukraine. All these aircraft were based at Gbadolite and flown mainly by Serbian mercenaries. With few exceptions it remains unknown exactly what happened with each of these aircraft and how were they used after their arrival in Zaire, in late 1997. The MiG-21s arrived in kit form and were put together by group of Russian or Ukrainian technicians at Gbadolite. In the case of Mi-24s it is known that one hit a power line and crashed on 27 March 1997, killing the three crewmen and four passengers. The fate of at least one J-21 Jastreb was not much better: sometime in 1997 one of the Serbian mercenaries, called Turcinovic, was killed while flying an ultra-low-level pass over Gbadolite and clipping a lamp post with his wing. The wreckage of his aircraft fell directly into a column of young soldiers on a parade, killing dozens of them. Turcinovic apparently fell victim to a massive liquor problem. Colonel Gaddafi's forces have used the type to attack rebel forces during the 2011 Libyan Uprising. One was destroyed after landing on 24 March 2011 by a French Dassault Rafale after violating the No-Fly-Zone over Misrata. Another five together with 2 Mi-35 helicopters were reported destoyed by the French Air Force in the same area the following day, but satellite images showed that the five fixed wing aircraft were MiG-23s. Before the Yugoslav Wars, at least a dozen Galebs were purchased by American warbird dealers, and several are still on the civil register today. Other operators are located in Indonesia, Serbia, New Zealand, Slovenia and the United States. G-2A Two-seat advanced jet trainer, light attack aircraft. G-2A-E: Two-seat export version for Libya and Zambia. G-2Š Unarmed trainer. G-3 Galeb-3 Prototype of export version first flown 19 August 1970, with BMB (Rolls-Royce/Bristol Siddeley) Viper Mk 532 Turbojet engine from J-21 Jastreb, modern cockpit, cameras in tip-tanks, twice as higher capacity for armament, JATO (rocket engines for the reduction of takeoff) and other modifications. Libyan Air Force - (G2A-E version) 116 (rebels captured 5 aircraft at Misrata Airport on February 24, 2011 as part of the 2011 Libyan Uprising. A separate aircraft was destroyed on the ground by a French fighter with an air-to-ground missile as it was landing near Misurata on March 24, 2011 as part of the 2011 military intervention in Libya.) Another five together with 2 Mi-35 helicopters were reported destoyed by the French Air Force in the same area the following day, but satellite images showed that the five fixed wing aircraft were MiG-23s. Free Libyan Air Force - (G2A-E version) 5 aircraft captured from the Libyan Air Force at Misurata Airport on February 24th, 2011. 1 Galeb delivered together with 3 Jastrebs as part of a French - Yugoslav contract in 1997. Gunston, Bill. The Encyclopedia of Modern Warplanes: The Development and Specifications of All Active Military Aircraft. New York: MetroBooks, 1995. ISBN 1-58663-207-8. Gunston, Bill. Encyclopedia Of World Air Power. London: Crescent, 1987. ISBN 0-51749-969-X. Taylor John W. R. Jane's All The World's Aircraft 1982-83. London:Jane's Yearbooks, 1982. ISBN 0 7106-0748-2.